Any dummy knows you don’t go grocery shopping when you’re hungry, but today I had no choice. I just spent a grueling two hours making butter with second graders for Pilgrim Day at school, and the one saltine cracker spread with germ-infested delicious homemade butter which I ate just wasn’t enough for me. I was starving and wanted to head home to refuel (and maybe nap) but I knew — oh, I knew — that each passing hour from here on out would be crazy with Thanksgiving Madness at the supermarkets. Shopping hungry was the lesser of two evils. As we’ve established, I’m a sucker for packaging. 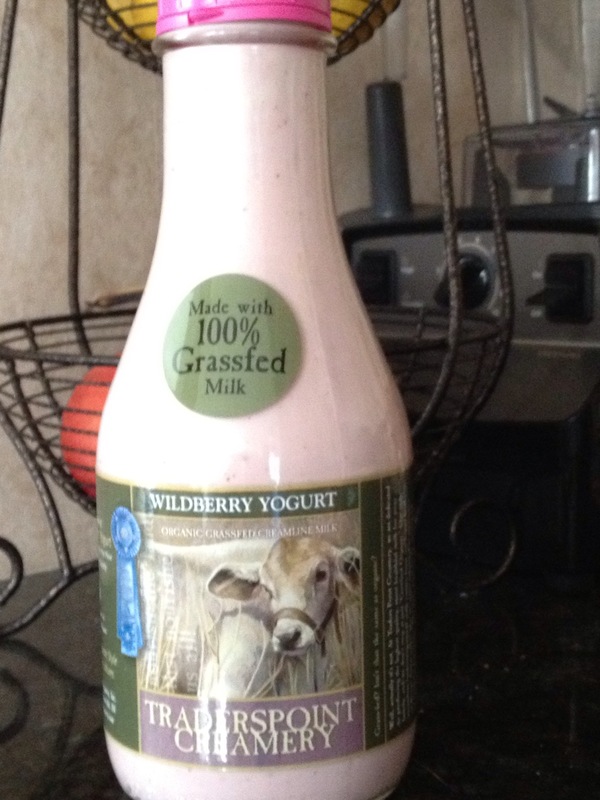 Also, certain words really get me, too, words like “creamery” and “grass fed.” And a real glass bottle with a pink lid? Powerless. The rational part of my brain didn’t even care it was paying seven bucks for yogurt, because it was made from happy grass fed cows from a real creamery, see? Well played, marketers. You got me again. But sometimes luck goes my way, because I really love this stuff. It is so fresh and creamy with just the perfect amount of yogurt tang and sweetness. I can’t wait until tomorrow so I can have some more! I bought the wildberry flavor today, and next time I plan on getting the plain because the website recommends sweetening it with…wait for it…maple syrup! My favorite sweetener! It’s like they know me! Verdict: Pricy but worth every penny. Grass fed, people. This entry was posted in Reviews and tagged review, Traders Point Yogurt by Mom Mom's Apron. Bookmark the permalink. Sounds delicious, what’s the size of the bottle? Hi Susan! I currently don’t have a bottle on hand, but I’m guessing somewhere in the neighborhood of 32 ounces. Have to agree with everything you say. I say it has enough tang to remind you it’s a yogurt! The price is misleading – it’s good value when you consider it on a serving by serving basis.